The new SemaConnect EV charging stations at East Coast Storage are open to the public. CHESTERTOWN, MD., UNITED STATES, September 26, 2018 /EINPresswire.com/ — East Coast Storage, located in Chestertown, Maryland, has installed two SemaConnect electric vehicle (EV) charging stations, the first public stations in town. Founded in 1706, Chestertown is a historic Kent County port town with a rich colonial history. The local Washington College, annual Chestertown Tea Party Festival, restored 18th-century homes and location along the Chester River bring in thousands of visitors every year. In February 2018, the Chestertown Environmental Committee announced its “Vision to Reduce Waste in Chestertown,” which included eight goals that would help the town move toward zero waste. The committee hoped that by working with local businesses to promote EV transportation, the town could reduce auto industry wastefulness and lower carbon emissions. 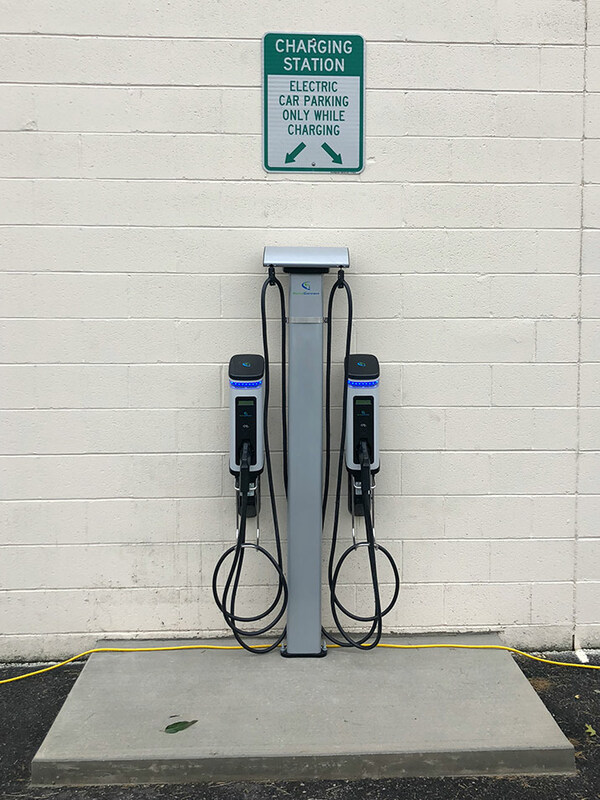 Robert Greenwald, owner of East Coast Storage, was asked by Town Manager Bill Ingersoll to be the first business in town to install charging stations for public use. After months of research, Greenwald chose SemaConnect to be his EV charging provider. He liked that the SemaConnect EV charging station was easy to use and interoperable with all electric vehicles, but what ultimately won him over was that SemaConnect was a locally owned company. As a business owner in a close-knit community, Greenwald wanted to work with a company that could truly understand his needs and values. By installing the SemaConnect EV charging stations, Greenwald hopes to serve members of the local community and college, and to provide a needed service for EV drivers visiting the Eastern Shore. Now EV drivers can charge in Chestertown rather than 25 miles away in Queenstown. “The new charging stations are there to support Kent County and help tourism, so people can get to and from Chestertown,” Greenwald said. The stations are on the wall facing the traffic circle at the intersection of High Street and Morgnec Road. They are open to the public and can be found on PlugShare and the SemaConnect app. An open house and ribbon cutting, planned in coordination with the Chestertown Chamber of Commerce, will be held on Nov. 15 at 5 p.m.
East Coast Storage is a locally owned self-storage company located on Maryland’s Eastern Shore. Founded in 2000 by Bob and Inki Greenwald, its mission to ensure satisfaction and value to its customers has helped East Coast Storage grow and serve customers in Chestertown, Millington and Perryville. For more information, visit http://www.ecstorage.com.